When was the last time you had a Queen’s Park Swizzle? The classic Caribbean cocktail named for a venerable Trinidadian hotel is a jewel of the tiki cocktail canon, and it’s enjoying resurgence at the hands of passionate rum ambassadors and tiki devotees such as Angostura Rum ambassadors Daniyel Jones and David Delaney, U.K. Rum Fest founder Ian Burrell and tiki bar owner Jeff “Beachbum” Berry. So much so that an entire seminar was dedicated to this one historic drink at 2016’s Tales of the Cocktail in New Orleans. Can you just feel the pebble ice shifting in the tall, narrow glass? Smell the aromatic bitters and muddled mint? Taste the sharp lime, sweet Demerara sugar and strong, dark rum? For all its charm, a long, cool Queen’s Park Swizzle wouldn’t be so magical without one thing: the swizzle. Part cocktail, part live performance, swizzle cocktails are so named for the technique (“swizzling”) and the implement (“swizzle stick,” or “bois lélé” in French) used to vigorously stir them. And—like a true libertine—you can have a whole pitcher of them at Libertine Social in Mandalay Bay. “The Queen’s Park Swizzle has quickly become one of my all-time favorite drinks,” says Libertine Social principal bartender Tony Abou-Ganim. That’s saying something; the “Modern Mixologist” ushered Las Vegas into the present cocktail-worshiping era when he introduced the lime squeezer to a little property called Bellagio in 1998. With two cocktail books and a complete line of barware to his name, Abou-Ganim has plenty of favorite cocktails from which to choose. “One of the keys to a successful swizzle,” he says, “is the proper ice.” To that end, Abou-Ganim and his business partner, chef Shawn McClain, selected a Scotsman pebble-ice machine for just this reason. Of the five swizzles on the Libertine Social menu, four are classic recipes: Queen’s Park, Bermuda, Barbados Red Rum and Green (made with gin). Martinique Swizzle is an Abou-Ganim original that uses the Queen’s Park template, but which adds Rhum Clément Créole Shrubb and his own Double-Barrel chicory coffee-pecan bitters (which he quietly launched in July at Tales in New Orleans). All five drinks are hand-swizzled and serve four for $58, though individual cocktails are also available. From left: a barrel-aged Boulevardier, draft Sun Splash, Libertine Fizz, house-made limoncello shot, Cable Car and a bottled Luce Del Sol. As much as the swizzle is a showpiece for Libertine Social, it’s in equally stunning company on a menu that touches every part of the convivial, social act of imbibing. You’ll find fizzes (another almost lost art) and top techniques of the moment such as barrel-aged, draft and individually bottled cocktails, as well as cheeky frozen shots and retro cocktails that have the ability to transport guests to a different time. 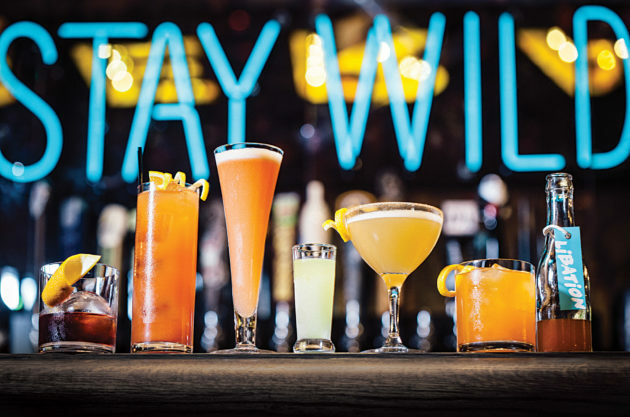 In addition to Abou-Ganim’s bitters, and the intimate Arcade bar off the main lounge, you’ll find his signature in the fizz lineup, specifically the glass they come in. “I’ve been working on a fizz glass for years. No one is really doing fizzes,” he laments. At Libertine Social, fizzes are served in a glass Abou-Ganim created with manufacturer Steelite International. With the exception of the Bird of Paradise and the Imperial, the recipes are also Abou-Ganim’s own, and all are served in an elegantly flared Modern Mixologist Fizz Glass. The post Shareable Hand-Swizzled Cocktails Put the ‘Social’ in Libertine Social appeared first on Vegas Seven.